I’ve said it before and I’ll say it again – I don’t use the label “The Best” lightly. Some people use it with abandon for social media enticement purposes but I use it sparingly so that when I do use it, you know I mean business. Overall, I try to eat a fairly healthy diet. I eat well a majority of the time so that on occasion, I can enjoy a splurge and still feel a sense of balance. This approach means that when I do enjoy a special occasion sort of food, it had better be worth my while. How disappointing is it to eat a calorie/fat/both bomb only to find that it was totally not worth it? In the past, fried chicken has often fallen into that category for me. Something that should be so darn good, but whether from a restaurant or homemade, has often fallen short of my expectations. Last year I came across this recipe while flipping through one of my very favorite cookbooks and the lovely photos caught my eye. 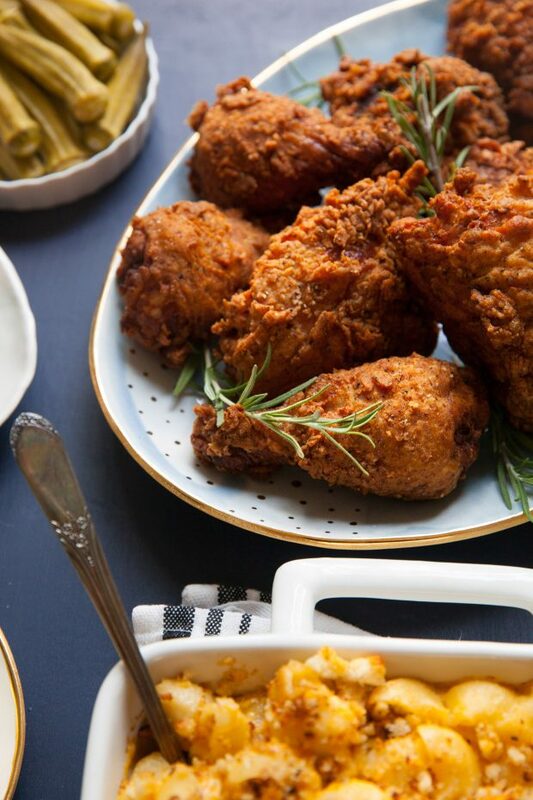 Then, I was hooked by Michael Ruhlman’s declaration: “This is the best fried chicken, ever. There, I said it. If it’s not, then I want to try yours.” Given its nature as a splurge food, it took me over a year to get around to finally trying this and now I am totally kicking myself for that wasted time. 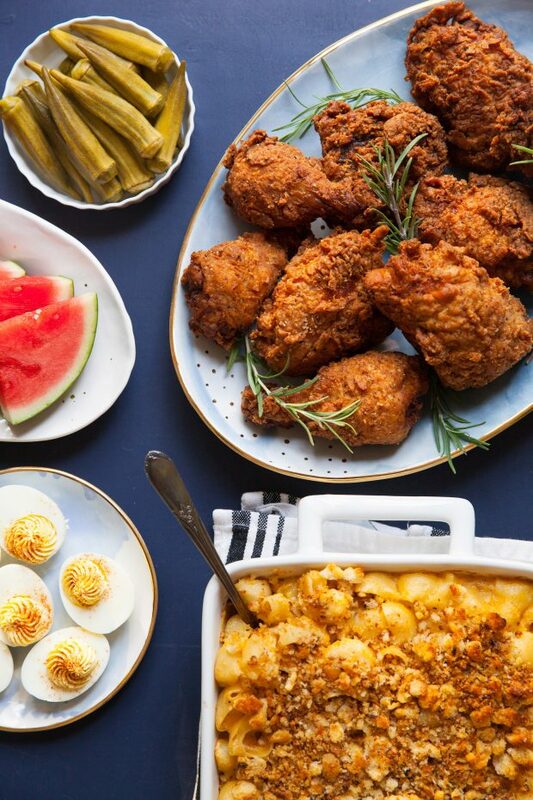 This fried chicken really is the best – Ruhlman killed it with this recipe. There are many reasons this is so spectacular. It starts with a brine that locks in moisture and steeps the meat with aromatics. The chicken is dredged twice in a spiced flour mixture, which makes for a perfectly spiced and crisped skin. The whole technique is solid, straightforward, and yields the fried chicken we all deserve. I have found that if you prep the brine and flour mixture in advance, it lends itself well to entertaining as long as you are comfortable with frying. Might I suggest pairing with pickled okra and my favorite macaroni and cheese? Invite some friends over this weekend, pop some bubbly, and have yourselves a feast! To make the brine, combine the onion, garlic, and oil in a medium saucepan over medium-high heat. Add in the salt after the onion and garlic have cooked for 30-60 seconds. Sauté until translucent, 3-4 minutes. Add the rosemary and cook to heat it, about 30 seconds. Add the water and lemon, squeezing the juice into the water and removing any seeds. Bring the mixture to a simmer, stirring to dissolve the salt. Remove the mixture from the heat and let cool to room temperature. To speed the cooling process, set in a bowl over an ice bath and stir occasionally. Place the chicken pieces in a gallon-size sturdy plastic bag and set in a large bowl for support. Pour the cooled brine with aromatics into the bag, sealing so that you remove as much air as possible. Refrigerate for at least 8 hours and up to 24 hours, turning the bag occasionally to redistribute the mixture. Combine the flour, black pepper, paprika, sea salt, cayenne, and baking powder in a bowl. Whisk to blend. Divide the flour mixture between two shallow dishes. Pour the buttermilk into a bowl. Set a rack on a baking sheet. Dredge the chicken in the seasoned flour, shake off the excess, and set the dusted pieces on the rack. Dip the pieces in the buttermilk, then dredge again in the second dish of seasoned flour. Return them to the rack. Heat the oil in a large, high-sided pot for deep frying to 350Ëš F. Add as many pieces of chicken as you can without crowding the pan. Cook, turning the pieces occasionally, until they are golden brown and cooked through, 12-15 minutes. (I take them out as soon as the skin is golden brown and monitor the internal temperature with an instant read thermometer, which should read at least 165-170Ëš F.) Remove to a clean rack and let rest 5-10 minutes before serving. Garnish with additional rosemary sprigs.